This book introduces readers to Christmas Falls and the girls who were friends there but have drifted apart. It focuses on Ashley and her relationship with Brent- which is sweet, but the miscommunication to create conflict was a little too melodramatic for me. It was interesting how much Ashley loved her friends but was afraid to reconnect with them. The author's writing style also wasn't my favorite- including run-on sentences and missing commas which would have made more natural pauses in the rhythm of the words. Overall it was a decent story and because the rest of the books in the series are by other authors, I kept on reading. Eight years after fleeing Christmas Falls because of a high school prank gone wrong, Ashley Brooks receives a mysterious letter from her mentor asking her to come home. She arrives to face all she left behind—her family, her friends, and the rich boy she’d loved who would never date the girl from the wrong side of town. Brent Donnelly, high school jock, brainiac, and dutiful son did everything right until the day Ashley returns to ChristmasFalls. With one look at the girl who got away he questions all his life choices, including following in his father’s footsteps in the family business. 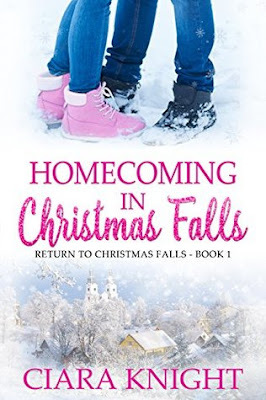 Faced with a potentially devastating decline of tourism in their hometown, Brent and Ashley must work together to save the magic of their town, but when Ashley discovers he still has feelings for her best friend she must finally face the real reason she left Christmas Falls—to try to heal her broken heart. Is there room for two on this honeymoon for one? Piper Wyatt’s Christmas wish is to get promoted to manager at Blackstock Hotel and Resort. Not only does the promotion mean more money, but it means more time with her son and proof that she’s not such a disappointment after all. Jace Petersen, successful owner of a national chain of sporting goods stores, finds himself alone and miserable on what should have been his honeymoon. That is until he literally falls onto the lovely Piper Wyatt. He’s intrigued with this woman who can fix a car in high heels. Too bad for him, he makes a horrible first impression, and Piper’s not allowed to mingle with the guests. While Piper tries her best to steer clear of Jace during his stay, she can’t help but notice he’s not the man from their first meeting. But is he worth risking her promotion? Or is Jace right, Piper deserves more than she ever thought possible for herself? Find out in this charming Christmas tale about finding love in the most unexpected place, a honeymoon. In one day, London Walsh finds out her ex is going to be her boss and that her parents are getting a divorce—and they want her to referee the situation. So when she’s offered the chance to spend the holidays in her old hometown of ChristmasFalls, far away from all the drama, she jumps on it. But the quaint town doesn’t feel quite like the home it once was. London shed the goth image that defined her in high school long ago, but no one recognizes the woman she's become. Except for Andy Broll, London’s childhood next door neighbor. He recognizes her immediately, which sends London’s heart fluttering as she starts to see Andy in a whole different light. But when her time in Christmas Falls doesn’t go as planned, will London face it head on? Or will she find a reason to run? As a political strategist at Dunlop Bennet & Associates, Lexi Townsend's career is going nowhere. She's a cubical dweller writing speeches for freshmen senators in DC. But if she can hitch her career wagon to a rising political star, she’ll be on her way to a corner office in no time. When she’s offered a plum holiday assignment–an ideal candidate with deep pockets, someone who could make the leap from local to national politics–she starts to dream about that corner office. Until she realizes her candidate is Kevin O’Malley, aka Kevin the Hottie, Kevin the Snob, Kevin the Liar, the same guy who shattered her high school reputation back home in Christmas Falls with a rumor. Assignment in hand, Lexi braces herself for the most difficult political race of her career--because this time it’s personal. Morgan Reed is excited to return to her hometown of Christmas Falls and open her beauty salon, but when she arrives to her rented business space she’s shocked to find it already occupied by Dallas Parker—her brother’s best friend, the guy she had a childhood crush on, and the one her mom blames for their family’s greatest tragedy. With their landlord out of the country and unreachable, Morgan and Dallas must open their businesses together. But, no worries, all small towns need a combo furniture store/beauty salon, right? Ugh. As they work together, Morgan tries to keep her emotional distance but time and off-the-charts chemistry soon turn a childhood friendship into a blossoming romance. Unfortunately, just when their relationship develops into something deeper, an unexpected crisis re-opens her family’s old wounds and the blame is on Dallas once again. Will Morgan’s sadness and fear pull them apart, or make her realize Dallas has always been her heart’s true safe harbor? When Caitlin Cook left the small town of Christmas Falls, Tennessee to attend Harvard University, she left behind the burden of her parents’ slowly increasing hoard of antiques, a much younger brother, and Shane Mitchell—the boy who blindsided her with the news that he loved her on the night before she left. Shane Mitchell spent his high school years fascinated by Caitlin Cook. The quiet flute player with her nose always in a book, he wanted desperately to find out what made her tick. Eight years later, Caitlin returns to Christmas Falls—unemployed and newly single—after receiving a devastating letter from her beloved high school mentor. Caitlin is shocked to find her childhood home in disarray, and her little brother in desperate need of his sister. With Shane’s help—now a pillar of the community rather than the carefree teenager Caitlin once knew—she begins to rediscover her love for music, antiques, and possibly even Shane. When faced with the choice of rebuilding her life in Boston, or giving love a second chance in Christmas Falls, will Caitlin be able to decide on the true meaning of home? Olivia Mackey spent her whole life hearing how she was destined for bigger and better places than Christmas Falls, Tennessee. A regular on the beauty queen scene from a very young age, she learned from her stage mom, that appearances mean everything. Having spent the years after high school traveling the world and failing at the dream everyone told her she should have, she's back home and wondering what she's to do next. Nothing is where she left it. Friends have scattered, her mentor is ill, and Olivia is fumbling her way through a big life in a small town. $100 Amazon Gift Card or Paypal Cash Giveaway Ends 11/5/17 Open only to those who can legally enter, receive and use an Amazon.com Gift Code or Paypal Cash. Winning Entry will be verified prior to prize being awarded. No purchase necessary. You must be 18 or older to enter or have your parent enter for you. The winner will be chosen by rafflecopter and announced here as well as emailed and will have 48 hours to respond or a new winner will be chosen. This giveaway is in no way associated with Facebook, Twitter, Rafflecopter or any other entity unless otherwise specified. The number of eligible entries received determines the odds of winning. Giveaway was organized by Kathy from I Am A Reader and sponsored by the author. VOID WHERE PROHIBITED BY LAW.